Institute take on Coleraine in the North West Senior Cup Final at the Showgrounds, tonight (KO 7.45pm). This will be Paddy McLaughlin’s first chance of winning silverware as manager of the Drumahoe club, but he knows it’s going to be tough against the in-form side in the country. “I’m looking forward to the Coleraine game, because as we haven’t had a game for a few weeks, the boys are really itching to get back playing,” he said. 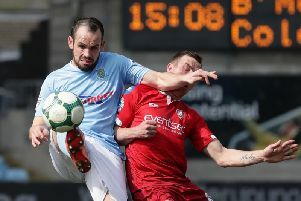 McLaughlin also confirmed that he may change things up for this evening cup final and he will be without Jamie Dunne, as the winger misses out through suspension. “I have somewhat of nice selection problem for tonight, because the cup final probably would have been a game where boys who needed the game time, they would have got a round out, but now they all obviously need game time, so I’ll have to wait and see,” he added. “We have a massive game on Saturday at home to the Harland & Wolff Welders, so I’ll have to juggle things around and take everything into consideration. As for the Bannsiders they could feature former ’Stute olds boys Michael Doherty, David Ogilby, Stephen O’Donnell, Ciaron Harkin, Darren McCauley and Joe McCready in their starting line-up, but one man who is likely to play is recent signing Martin Smith. The ex-Sunderland and Kilmarnock midfielder joins on a short term deal. “He has good traits and will fit in well with our squad,” said Kearney. “His international clearance wasn’t through in time for Saturday.